Plot Summary: When his wife is murdered by the church, the powerful vampire Dracula exacts his revenge by unleashing all the powers of Hell upon Wallachia. Wandering a land now plagued by hoards of demonic creatures Trevor Belmont, the last son of the excommunicated Belmont clan, seeks to defeat Dracula. 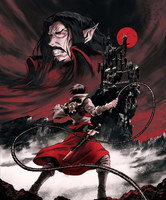 He is aided by the power of Sypha Belnades and Alucard, Dracula's estranged son.